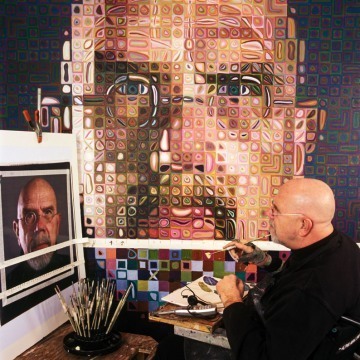 Chuck Close is known for his meticulous large scale painting and wasn’t the first artist that came to mind when I was told that there was a new book in which kids asks questions to an artist. The result however, is inspirational. Close opens up about his dyslexia and “face blindness.” He shares his struggles with art and his long recovery after he was paralyzed from the chest down after an artery collapsed in his spine. The layout for the question and answer portion of the book is colorful and appealing and is sprinkled with photographs from Close’s life. The center section of the book is interactive. 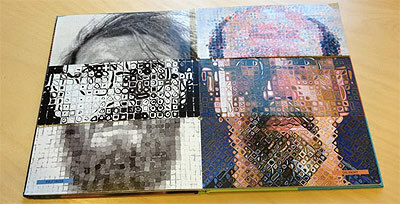 It has 6 double sided full color pages of portraits painted by Close. The sections can be flipped to create different looks. Because each painting represents a different technique, color or form of painting besides being fun, it is also educational! Kids will relate the in-depth paintings, will learn that painting doesn’t come easy, even for very talented artists and will see that even if they have disabilities if they are willing to put in the hours they can succeed as a artist.